Today is a happy day. I am saying this with hopeful thoughts that even the heavy rains outside would not shake my bright vibe. Early this morning, I took part in the construction work organized by the Habitat for Humanity. 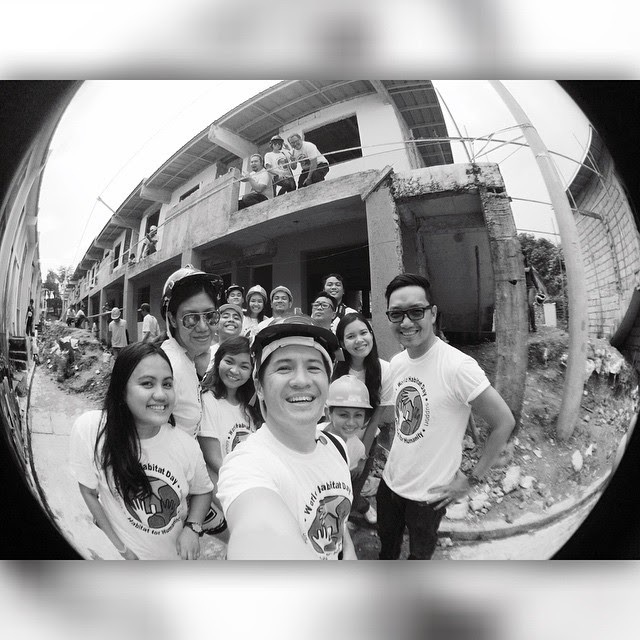 A few months ago, I shared that Habitat for Humanity tapped social media influencers to spread the word about the advocacy. I am delighted to be part of this pool. For many months I always think of volunteering a few hours to give back to the community, but it always comes at the bottom of the list because life has so many distractions. Habitat for Humanity joins the United Nations alongside organizations around the world in raising awareness and consciousness on the importance of building decent homes, by educating and mobilizing individuals and communities to take action in the current global housing crisis by observing the World Habitat Day. It is celebrated every first Monday of October - a world wide event that aims to make a call for new and innovative programs, policies and systems that would make our world a decent place to live for regardless of race or religion. 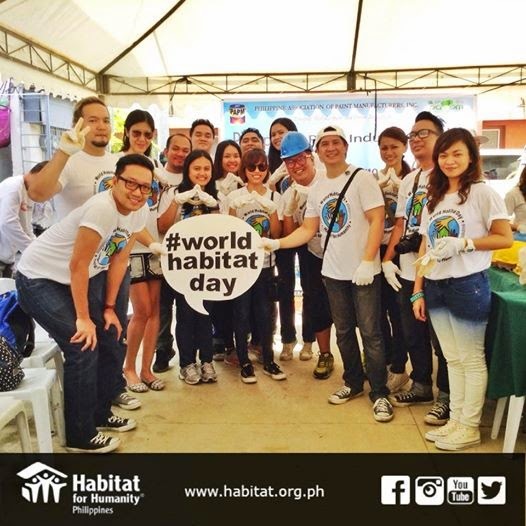 We celebrated the World Habitat Day two days earlier and we visited the beautiful community of Bistekville in Payatas, Quezon City where we took part in the construction of houses, helped out medical mission, participated in the sports clinic and bond with families. The Habitat team welcomed us to the Bistekville community. A simple neighborhood that reflects the peace and order any homeowner could wish for. We were briefed on the things that we need to do and reminded the goal of zero accident. Then we were ready to get those rollers and paint. I didn't expect the project to be in a deep excavated area with mountaneous soils. When I heard of house painting, I was expecting interior paint - the kind that I did for our home in 2006 and repainting in some schools. I didn't expect that part of the housing is mostly unfinished with scaffolding still up. It was all a surprise but that made the work more exciting. This is the first activity work that I did a physical stretch that could mean losing your life with the wrong move - most of the ones I did involved simple body work, knowledge transfer, or consulting. It makes me remember of the volunteers who do rescue work during times of disaster. I wish I would get braver in the future and do those things too. And although I know we could help in the real build (where we can get our hands dirty carrying hollow blocks and shovel) - I chose the lighter work because I was feeling a bit weak that day. I was actually set for the medical mission but part of me wanted to get my hands into painting colors in those walls. We stayed at the second floor, and we worked on the external walls. The whole experience was fun with competitive banters from Yen, Chuckie and Myke working on the other house next to what we were working on. Earth and I proudly finished two houses. Haha. But I have to admit that Yen, Chuckie and Myke's work is just smooth and fluid :) Good job! Lunch was served in lovely banana leaves - grilled fish and adobo. We also got the chance to visit some of the houses, Habitat for Humanity housing is a good 25 sq. meters with decent bathroom and kitchen. 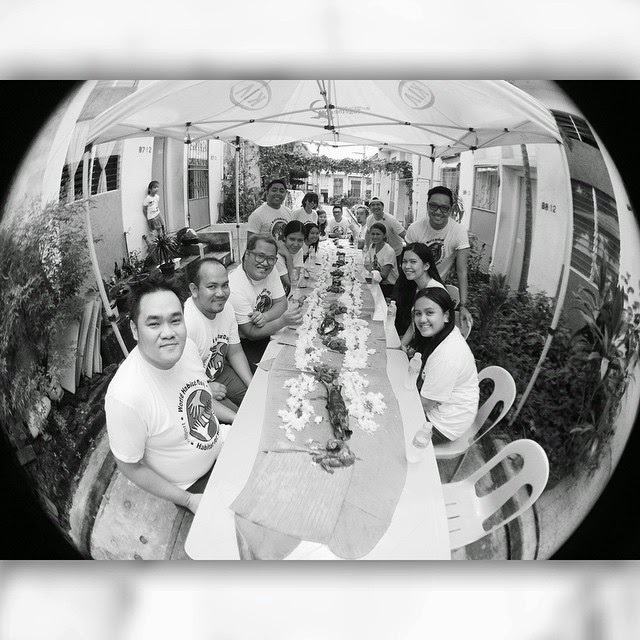 The kind that every Filipino family should have. Fun lunch and we did eat with hands! Thank you Habitat for Humanity for having me and for making me one of the Habitat Online Influencers. I have been to several volunteer work and I seldom talk about it or post it online because I felt that it is a personal commitment. But as a blogger, I know I have the power to make people "think". I got teased for still looking chic in this picture, but the real story was concealed by sweat and heat I was feeling that day. I am not used to having my picture taken or taking pictures during volunteer work (I even asked my friend to check how unholy I looked in the pictures!) - and I personally don't mind the sweat, the dirt and paint that I took with me after the work. It was all good. I wish I have more time to spend doing volunteer activities. I wish the time I spent battling the traffic could be spent building houses or helping others by means of knowledge transfer. 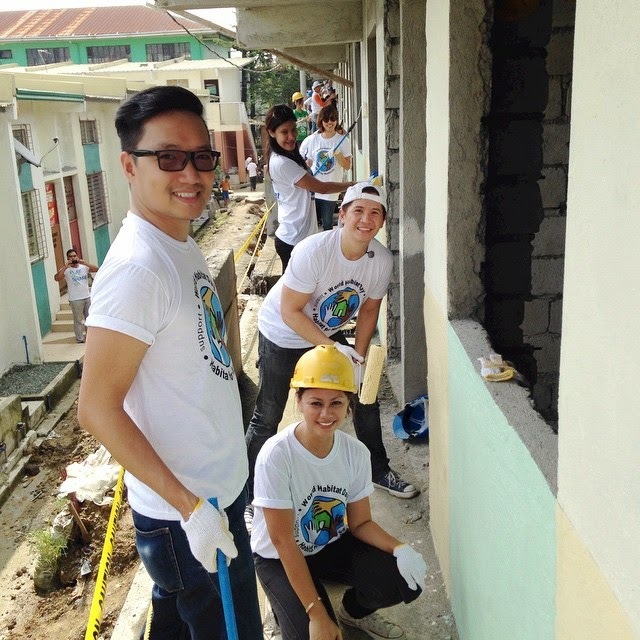 Habitat for Humanity Philippines' main day will be on October 11 - and simultaneous builds across the nation will take place in select towns nationwide - Metro Manila, Cagayan de Oro, Zamboanga, Mindoro, Bohol, Cebu and Leyte. 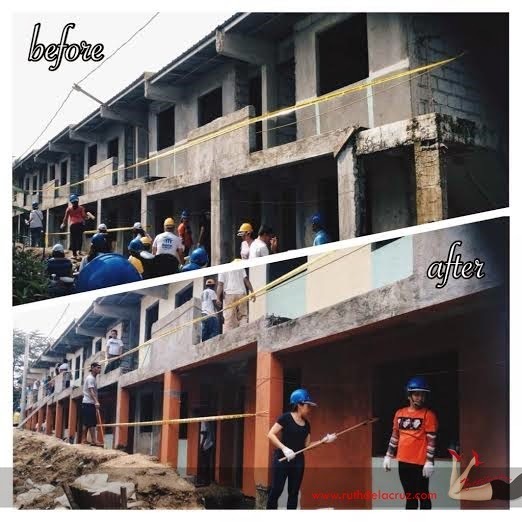 Through these events, Habitat for Humanity Philippines hopes to raise awareness that more than 4 million Filipino families still live in substandard housing (not including millions recently displaced by the Zamboanga conflict, 2013 Bohol earthquake and survivors of typhoon Haiyan). I always say that time is more precious than money or material things. If you have extra time, please.. the first step is to visit www.habitat.org.ph or www.facebook.com/habitatphilippines.